It’s just past 6 p.m. up at California Memorial Stadium and the 19th practice session of 2018 fall camp is in the books. But at this point, every tackle and drill is just one big blur. All that lingers on the north end of the field are echoes of screaming coaches and shadows of players whose blood and sweat have seeped into the green AstroTurf. The bleachers are abandoned and just outside the stadium’s massive concrete walls, people bustle about their daily routines. For one player, the north end zone and tunnel hold a special significance. He points up to the stands, just behind the goal post. California Memorial Stadium is where redshirt sophomore Cameron Goode enters his second season as a starting outside linebacker — where, last year, he helped pull off an upset win over an SEC team in the play that got his name on college football’s radar. After the last glimmers of light left the Houston sky on a hot Fourth of July night, Goode knew he had to return to Berkeley. 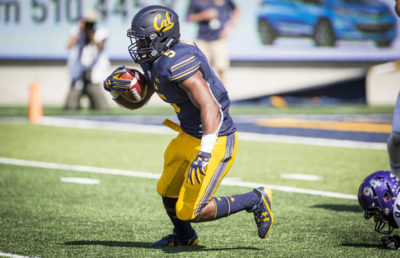 The end of a brief vacation during the summer of 2016 meant Goode’s first fall camp with Cal football loomed in the distance and he had a flight to catch — Houston’s George Bush Intercontinental Airport to Oakland International Airport. 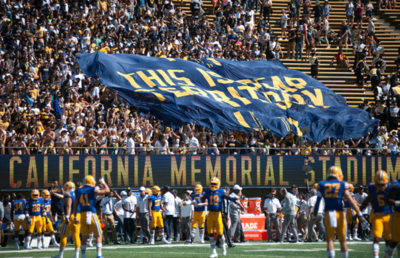 California Memorial Stadium awaited him, but whether Goode would be sitting in his seat when the flight attendants made their final call was uncertain. “I didn’t think he was going to get on the plane to go back,” says Crystal Goode, Cameron’s mother. Long before Cameron Goode was receiving offers from Cal, Nebraska, Vanderbilt and a handful of others to play collegiate football, he sat in an Oklahoma Sooners jersey. Just a baby, his father’s gear was far too large for him, but the shoes that James Goode left behind were just big enough for Cameron to one day fill. That is, if he wanted to fill them. Despite growing up with a defensive lineman for a father, one who played for the University of Oklahoma, Cameron found himself drawn to a different field when it came to sports — one with brown dirt, rubber pitching mounds and white bases. Goode lined up at tight end — a time in peewee football when boys’ helmets are often larger than the rest of their bodies — but he was tired of blocking. The position lacked action. On top of that, Goode’s first encounter with the sport was spoiled by a sour-headed coach, who made football seem like more of an obligation than something that could eventually turn into a passion. “Cameron actually wanted to quit,” Crystal says. But a change in leagues, teams and a familiar face on the sidelines the next year gave football a chance to erase the bitter first impression it had left on Goode. With guidance from his all-time favorite coach, in addition to both knowledge and tough love, Goode finally took a liking to America’s game. 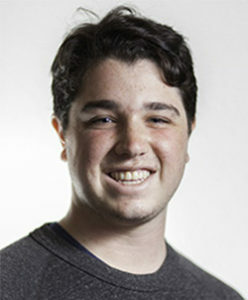 Throughout his childhood and leading up to high school, Goode excelled at both baseball and football — juggling both sports and developing real skill on each field. But as he prepared to enter the ninth grade, he sat his mom down. He was hanging up his cleats. “I started crying because I was like, ‘What do you mean?’ ” Crystal says. Hanging up his baseball cleats, that was. Goode wanted to give his sole attention to football — a decision that made his father happy and one that shaped the rest of his future. He entered Klein Collins High School in Spring, Texas, where he would eventually become a starting linebacker for the Tigers. His talent was on full display during his junior and senior years and he reaffirmed that his toughness was an indispensable aspect of his game. Rate your pain, 0 to 10. It’s a common way that doctors gauge a patient’s discomfort. Based on Goode’s attitude and complete disregard for his own pain, it wouldn’t be easy to diagnose that he played through two torn shoulders during his junior year of high school. “Some games they would be good; some games they would be slipping around and it hurt like hell,” Goode says. Goode was tough, though, and he battled through the pain without ever complaining. “Even after he had both surgeries, the surgeon couldn’t believe that he didn’t need pain medicine,” Crystal says. Two years later, Goode would need to channel a different kind of toughness as he prepared to take on a starting role for the Bears in the team’s season opener against the Tar Heels. Knowing it was Cameron’s first collegiate game as a starter, the Goode family booked plane tickets to the University of North Carolina well in advance. The day was even more special, as Cameron’s dad had his first collegiate start on the same campus, 29 years earlier, as a Sooner. They bought their tickets and couldn’t wait to make the trip. But as the Houston area flooded with the worst of Hurricane Harvey, the Goodes’ hopes of making it to UNC crumbled. Heartbroken in more ways than one after the inconceivable tragedies that riddled their community, the Goodes managed to find a silver lining. While they could not witness Cameron’s Cal debut firsthand, they were present for Cal vs. Ole Miss just a couple of weeks later — a highly anticipated bout that brought a team from the SEC to Berkeley. With a national audience tuning in, the game hung in the balance late into the fourth quarter. Ole Miss quarterback Shea Patterson commanded the helm at the Rebels’ 28-yard line down on California Memorial Stadium’s field. His team trailed the Bears, 20-16, with 3:11 to play. On third and seven, Patterson’s eyes drifted downfield in an attempt to reaffirm the South’s football dominance over the West, to prove that the Pac-12 couldn’t hold a candle to even a lowly SEC team. Three receivers lined up to the left of the center, Patterson palmed the snap, drop-stepped back and zeroed in on a target. The touchdown that followed sealed the deal. Patterson’s spiral found itself in the hands of a wide-open Goode, who, 32 yards and a nasty stiff-arm later, leaped into the end zone. Goode celebrated with jumps of joy and friendly shoving with his teammates. But mere moments passed before he regained his composure — true to Goode’s humble style of play, he never lets the highs get too high. Ole Miss 16, Cal 27. George Bush Intercontinental to Oakland is now a frequent route that Goode flies. Goode is a quintessential detail of Cal football — one who lets his actions during the game speak louder for him than he ever will in a postgame interview. Today, Goode will run onto the field with the starting defensive unit for the Bears. This time, his family will be in the stands cheering for their favorite player during his season opener. After a big play, fans might see Goode get rowdy and loud. But don’t blink, because you might miss it. 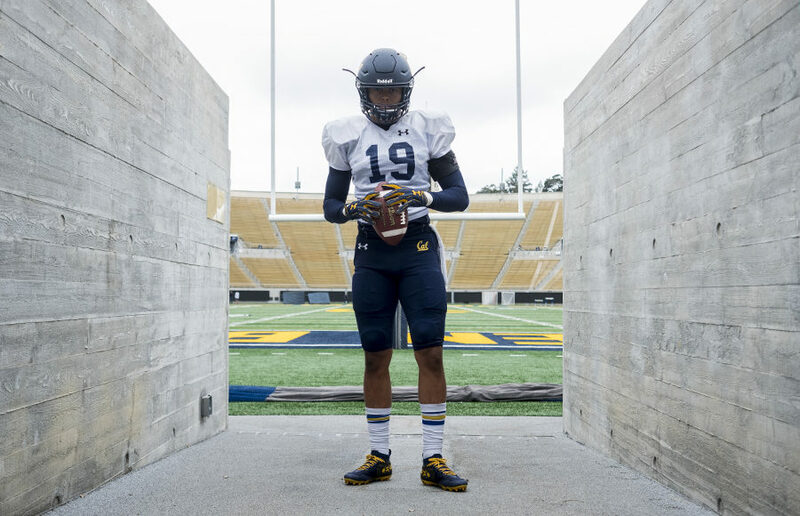 Look toward the north end of the stadium, where Cal runs out of the tunnel to take the field, and one thing is guaranteed when you spot the jersey adorned with the number 19. The Goode times are about to roll. Christie Aguilar covers football. Contact her at [email protected]. Follow her on Twitter @caguilarsports.